I've been truly impatient to read Evelyn Pryce's sophomore novel ever since I thoroughly enjoyed her debut A Man Above Reproach a couple of years ago. 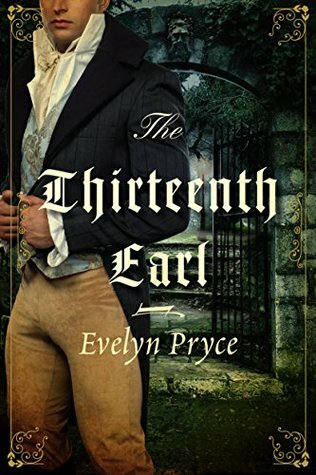 And so it was with utter delight that I opened my mail a few days ago to find a copy of The Thirteenth Earl, complete with wax-sealed note. It's the charming little things, guys, that just make my little world go round. Montlake has gifted this novel with another gorgeous cover in the same vein as the first one that initially caught my eye. They're just slightly refined in a way that appeals to me, and I love seeing their spines on my shelf. If you haven't tried any of Evelyn's work yet, I highly recommend snagging a copy of both of these. She writes lovely historical romance with characters I feel for that make me laugh. Just what the doctored ordered for the doldrums before spring arrives full stop. Jonathan Vane's title is Viscount Thaxton, but he is better known to all and sundry as the Ghost. The product of a long line of earls with an unfortunate predilection for running mad, Thaxton is determined he will be the last. The curse will end with him. As such, he's ready to live out his days unattached, unmourned, and decidedly unmarried. This decision is put into mortal peril when he makes the acquaintance of one Miss Cassandra Seton at the house party of his one (possibly only) friend. Cassie (to her very best friends) is about to be reunited with her longtime fiancé Miles Markwick after a separation of nine years. It follows that Miles is Thaxton's cousin and that the two are on most unpleasant terms. It's more than Thaxton can do to not needle the lovely Cassie about her upcoming nuptials. She responds delightfully in kind, and it's not long before the two are traipsing about the manor at all hours of the night, egged on by the eerie wails of a potentially real ghost. But even as their relationship deepens, neither one can discount the troubling strain that runs through Jonathan's family, or the fact that Markwick is bound and determined to finally make good on his vows. "My very best friends call me Cassie." "Then I shall start with Miss Seton, and endeavor to Cassie." From the opening mock duel in the middle of the library, The Thirteenth Earl is the most delightful of romps. Much like a game of Clue, the principal characters get up to all sorts of shenanigans, slinking about the atmospheric estate investigating the nefarious events at the party. I was altogether charmed and wanted very much for Cassie and Thaxton to find a way of overcoming the admittedly real barriers between them to find a vein of happiness. I love how Ms. Pryce manages to inject wonderful levity into her story at the same time as she infuses both her protagonists with achingly complicated backstories and throws them together to tackle their demons. Cassie is a lodestone of forthrightness and intelligence. She had my allegiance from page one. She sees every one of Thaxton's flaws, but she also sees the light peeking out behind his mountain of burden. Thaxton is beating a path to his grave until he meets Cassie. And to his credit, he sees her for what she is, too, and cannot abide the thought of all her light and intelligence being thrown away on a beetle like Markwick. Their midnight rambles, their middle-of-the-maze assignations, crept into my affections in no time. I believed how they felt about one another. I trusted them to find a way out of the labyrinth. "It is a consistent worry of mine how little you value your life," she said. He did not answer, and it made the portrait room too soundless, like an unused church. As if the air had gone stale. He had worn grey—why had he done that? His eyes matched the fabric, and it rendered his whole form drawn and sad. Ashen. Half in and half out of this world. Like an apparition. She had fallen in love with a ghost. The novel's ongoing themes of what it means to truly be alive and how certain ways of going about one's life can actually be a kind of slow death were thoughtfully explored, the forays into nineteenth century spiritualism fascinating and amusing. I find my only complaint with Evelyn Pryce novels is that I wish them longer, so that I can spend more time unraveling the threads of the tale along with the characters I've fallen in love with. But this one does work itself up to a properly smashing conclusion, complete with pistols at dawn and Cassie at her most brilliant. Neither Thaxton nor I could look away. The Thirteenth Earl is due out March 22nd.